Set amongst the Israeli-Hezbollah war in Lebanon in 2006, the plot of the Syrian mirrors the deceit, tension, and intrigue that has been the history of the Middle East for thousands of years, a perfect setting for a romantic thriller. As Nadia is about to declare her missing husband dead and marry her new love from America, her best friend, Sonia, tells her that her husband is still alive. But Sonia’s motives are other than friendly. Even though Nadia no longer loves her husband, she feels responsible for him and sets out to free him. In order to do that she has to bargain with the head of the Syrian secret police, a powerful and dangerous man who has been wanting Nadia for years. 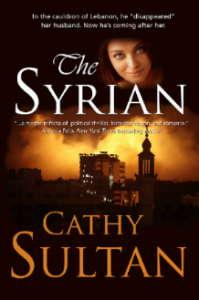 The Syrian is fiction, but Cathy Sultan blends fiction with history as she weaves her characters through the history of the time, something she knows firsthand as told in her book Israeli and Palestinian Voices, a collection of interviews and first-hand experiences in a region gripped by religious fervor and fanaticism. The Syrian is a well-written, fast-moving thriller of romance, betrayal, and intrigue that will keep you turning the pages and wanting more, even at the end—there’s a sequel in the works!